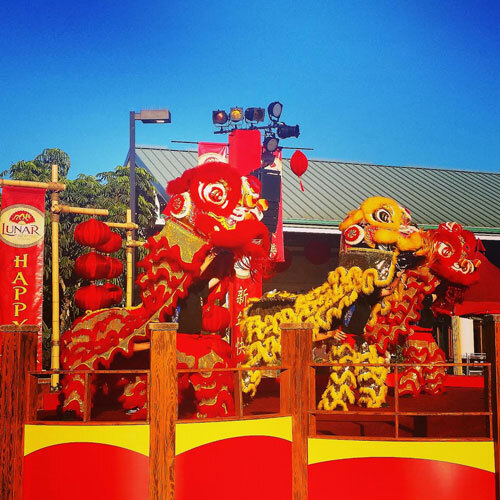 SeaWorld Lunar New Year Celebrates Asian Traditions! As SeaWorld San Diego passholders, we visit often. 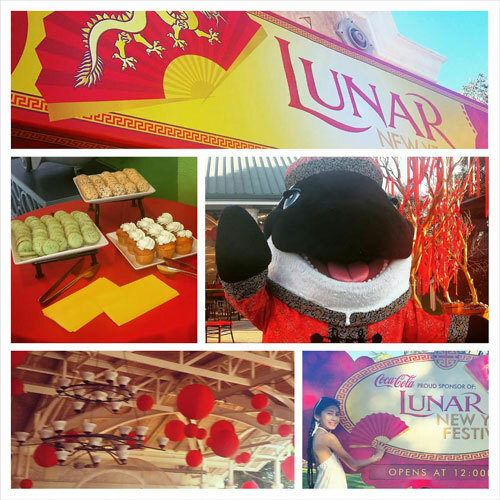 We’re also invited to preview special events on occasion, and had the opportunity to experience the sites, sounds, and flavors of the inaugural SeaWorld Lunar New Year Celebration. 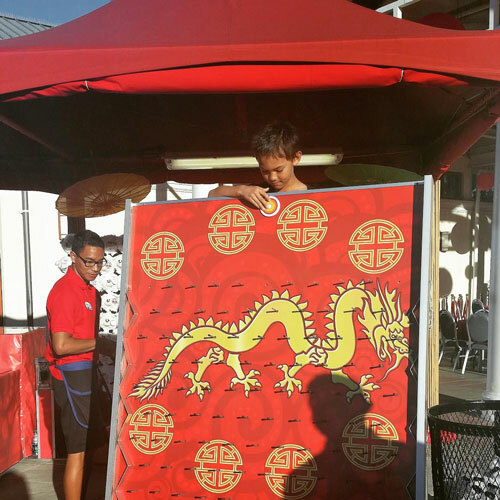 The family-friendly SeaWorld Lunar New Year event is free with park admission, and includes live performances such lion dancers, Chinese Heibei acrobats, drummers, and more. 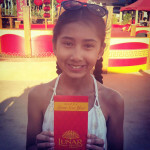 Guests receive a red envelope with a special gift inside upon event entry. Gifts range from free drinks to front-of-the line ride passes, to return entry tickets, and more. Be sure to get yours when you enter! Character Photo Opps, Animal Encounters & More! The Lunar New Year festivity area is located just east of Explorer’s Reef. 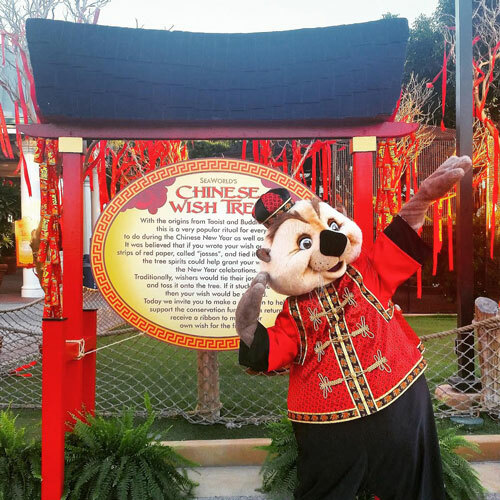 There are some fun character photo opps, including one with an adorable otter character dressed in Asian attire, as well as Shamu dressed in his Lunar New Year best. You’ll also find beautiful Lunar New Year decor in this area, animal encounters, and a shaded seating area as well. Games and food can also be found surrounding the stage, and are an additional fee. The lion dancers, which perform at the festival area, are absolutely incredible! Our kids, as well as all the other kids around us loved watching them. We highly recommend taking in one of their performances. We were in awe of the incredible Chinese acrobats of Heibei! This acrobat show is set at the indoor Mission Bay Theater, and includes chair stacking, hoop diving, plate spinning, acrobatics, and more. Be sure to catch one of the 25 minute performances! The entertainment is comparable to that which you would pay top dollar for at a performance hall or event center. Asian-inspired cuisine is available for purchase, and includes both vegetarian and non-vegetarian selections, including boa sandwiches, lumpia, spring rolls, pot stickers, noodle soup and more. Yummy desserts and beverages are available too. We never knew we liked macarons as much as we do until we tried the mouth-watering green tea ones available during the event! SeaWorld Premium Passholders can receive a free companion ticket for the event by registering their pass barcode on the SeaWorld Passholder Website, and requesting the ticket from there. We’ve already done so with ours, and are excited to bring additional family members to experience the SeaWorld Lunar New Year Celebration with us as well. Daily admission tickets as well as yearly passes can be purchased on the SeaWorld San Diego website. If you plan to visit multiple Southern California attractions, you might benefit from purchasing a Go San Diego Card: save up to 15% instantly on 3, 5 and 7 day cards!